Accelerating software development by concurrent use of the microcontroller debugging interface for measurement, calibration and debugging. The ECU debug connector can be a challenge to access in the vehicle and does not lend itself to the frequent disconnect/reconnects necessary when switching between MC and debug tools. By working together, Vector and Lauterbach are responding to the requirement of the automotive industry for concurrent use of the interface, and they are providing uniform access to the ECU for measurement, calibration and debugging purposes. This work is based on the new ASAM standard “Software Debugging over XCP” which was released in November 2017, and both partners were active participants in its development. The VX1000 measurement and calibration hardware from Vector enables accessing internal data of development-level ECUs and near-production ECUs. Data rates of more than 100 MByte/s can be achieved over the entire automotive temperature range in test vehicles. 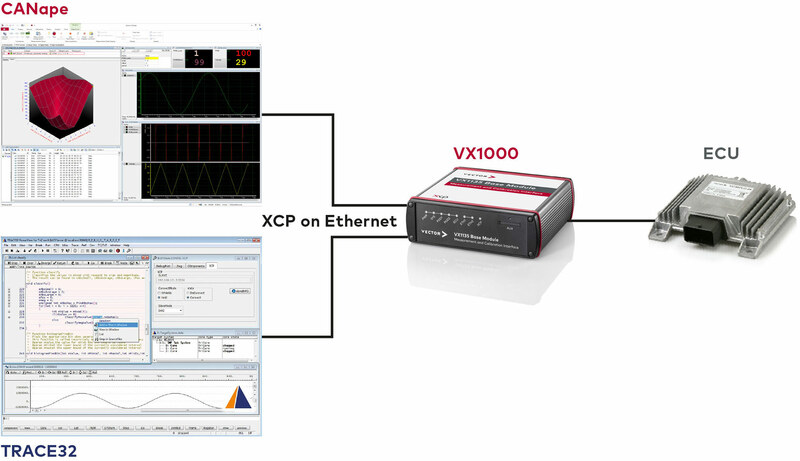 The XCP slaves of the VX1000 hardware enable connection to the CANape measurement and calibration tool or to other tools with a standard-compliant XCP master. Such an XCP master is Lauterbach's TRACE32 debugger, which gets access – over the XCP slave – to the ECU and the debugging interface connected to it. This debugging configuration can operate without the need for any extension of the ECU software. Here, the TRACE32 XCP master provides the same debugging features as a hardware-based TRACE32 debugger.